This week’s Student Athlete of the Week is a three-sport athlete who is paying it forward. “She's nice and smart, said Hatton. "I want to be like her." Second-grader Hatton is the buddy Shannon mentors one day a week after school. “It's just a good way after a school day, where you're working hard, just to get a young energy with you and to bring you back to the easy simple things,” said Shannon. There's nothing simple about Smith. The Roland Park Country School junior is a three-sport athlete. She plays field hockey, basketball and lacrosse. “My favorite is definitely lacrosse," Smith said. "I fell in love with that at an early age." She's the youngest of four siblings. She remembers the first time she watched her brother pick up a lacrosse stick, then doing the same. “When I picked it up I pretty much couldn't put it down ever since then. Every year I play I just love it more and more," Smith said. “Shannon's always been someone who stands out – her athleticism on the field, her speed, her desire to be the best she can be,” said RPCS Head Lacrosse Coach Meg Miller. She's the REDS' team captain. She's also the Vice President of the RPCS Athletic Association. Her drive for athletics is mimicked in her academics. She takes A.P. and honors courses. “She's hungry to learn. She's hungry to get better every day. She puts in the work,” added Miller. Shannon is verbally committed to play lacrosse at University of North Carolina for Tar Heels Head Coach Jenny Levy, a Roland Park alum. 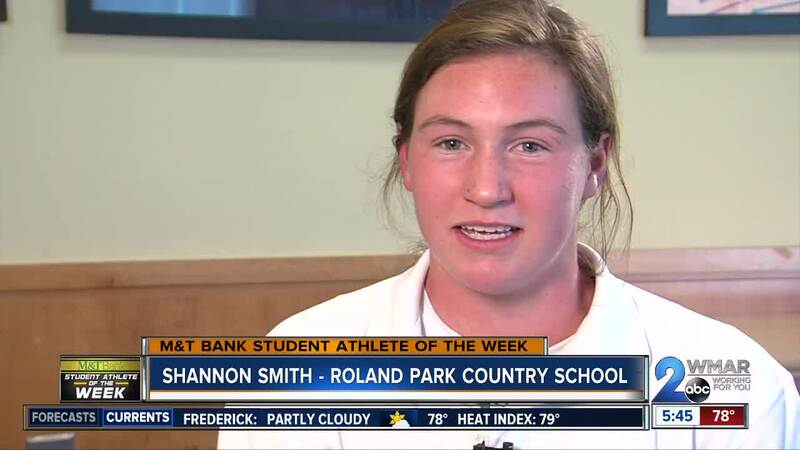 Congratulations Shannon Smith. You're this week's M&T Bank Student Athlete of the Week. To nominate a student athlete to be the next M&T Bank Student Athlete of the Week click here.